Drive Mode Select presents options for steering feel and throttle response. Drivers can choose from Eco and Sport settings. When using different settings, the driver experiences a vibrant changing color palette and dynamic graphics that monitor vehicle performance. An efficient and balanced powertrain starts with an eager 1.6L gasoline engine that works in concert with 32kW electric motor that delivers 139 combined horsepower. Power is delivered to the road by a 6-speed Dual Clutch Transmission making it nimble to drive through traffic and smooth when cruising at highway speeds. Its design was first used and later perfected in high-performance driving and racing applications. Now, it's your turn. Grip the thickly padded D-cut steering wheel and go with an added sense of confidence and control. Make every road a more beautiful place. Turn a parking lot into a scenic viewpoint. 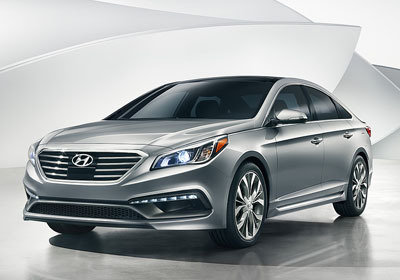 The Sonata Hybrid exhibits a sleek, sculptured design that achieves a class-leading lowest 0.24 coefficient of drag. Part of designing a hybrid that’s more beautiful on the inside is giving you a better view of what’s outside. With the available power tilt-and-slide panoramic sunroof, everyone can get their daily dose of sunshine, fresh air and vitamin D.
The standard LED Daytime Running Lights and LED taillights not only look great but also increase visibility. 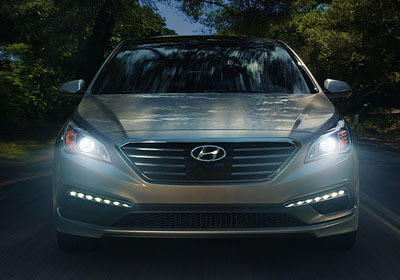 The available HID Xenon headlights are a brilliant upgrade, while the available automatic High Beam Assist feature automatically switches from high to low beam headlights when an oncoming vehicle is detected by the forward-looking camera. Space And Flexibility You Can Appreciate. Real utility starts with a spacious interior. Ioniq Hybrid’s 26.5 cu. ft. of cargo space is huge. Plus, there’s a conveniently large hatch that gives you better access for loading and unloading than any trunk. The 60/40 split-folding rear seatback presents many useful options for both seating passengers and securing cargo. It’s Even Better At Charging Your Phone. When it comes to technology and convenience, Ioniq offers the ease of wireless charging for your phone. There’s no need to mess with cords or plugs, just set your phone on the charging pad in the center console to charge. There’s even a handy holder for your tablet between the front seats. Being warm makes you a happier person. Let’s ace it, warmth makes everything feel better, more luxurious even. And for those in the colder of climes, these toasty seats prevent your morning drive from being a chilly wake-up call and the low point of your day. It’s nice that something so elemental is so simple; all it takes is the push of a button. When Your Car Knows You, It Knows What To Do. If you share your car with another driver, here’s another excellent feature. Ioniq’s Integrated Memory System moves the driver seat based on each driver’s stored position. It’s sharing made easier and better. You save time and hassle by just pressing a button. It also comes with easy seat access which moves the seat back once the engine is turned off, making exiting and entering the car easier. Getting The Keys To Your New Ioniq Is Awesome. Not Needing Them Is Bette. 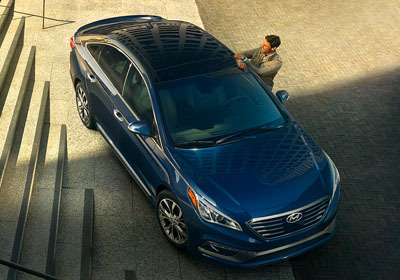 Blue Link® provides additional safety, security and connected convenience for your Hyundai. Access the suite of features with your smartphone, smartwatch, a web application, or the in-car system to find that next latte, lock your car from inside the stadium, stay informed on vehicle health, or call for help. In the event of an accident, it can send an automatic collision notification and request assistance. Even securely and remotely start your car and set the climate control to cool the interior on sweltering days or heat the interior and defrost the windshield on cold mornings. This available radar-based system helps detect when a vehicle is in the driver’s blind spot and provides both an audible and a visual alert to help keep you aware as you move down the road. When reverse gear is selected, Rear Cross-traffic Alert helps identify and warn the driver of vehicles approaching from the sides. Lane Change Assist measures the closing speed of an approaching vehicle in the adjacent lane to determine if changing lanes is safe and if it’s not, gives the driver an audible and visual warning. Feeling safe in your surroundings is important to people wherever they are—especially in their cars. So when it comes to safety, Ioniq offers some of the industry’s most innovative and popular features that are available, including Automatic Emergency Braking with Pedestrian Detection, Lane Departure Warning, a standard rearview camera and 7 airbags including a driver’s knee airbag. Let's start with the advanced lithium-ion polymer battery. Its design, capacity and output make it a compact unit and one of the most efficient batteries available. The Ioniq Hybrid's battery unit is located under the rear passenger area. This lowers the vehicle's center of gravity and helps reduce energy loss due to inertia.